New Holland – If you have children in school in Missouri or Illinois, you need to be aware that Tyson Foods popcorn chicken products served in school lunch programs may be contaminated with plastic pieces. New Holland, Pennsylvania-based Tyson Foods is recalling approximately 1,148 pounds of frozen popcorn chicken products, according to the USDA’s Food Safety and Inspection Service (FSIS) because the products may be contaminated with pieces of hard plastic. 35 cases of 32.79-lb. 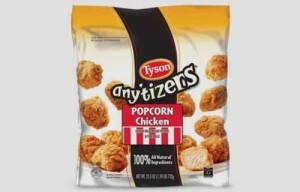 “TYSON FULLY COOKWHOLE GRAIN GOLDEN CRISPY POPCORN CHICKEN, CHICKEN PATTIE FRITTERS”ED, with a case code of “70368/928” on the upper right-hand side of the label. The recalled products bear establishment number “P-1325” inside the USDA mark of inspection. The recalled products were shipped to a distributor in Illinois and in turn further distributed to schools and food services in Missouri and Illinois. found inside a bag of Tyson brand whole grain popcorn chicken product. To date, there have been no reports of injury or illness associated with the consumption of the recalled products, reports Food Safety News. Anyone concerned about illness or injury should consult their healthcare provider, and Tyson Foods is asking consumers who have purchased this product to not consume them. The recalled products should be thrown away or returned to the place of purchase. On September 27, 2016, Tyson Foods had to recall approximately 132,520 pounds of fully cooked chicken nugget products from a different processing plant because of the presence of hard plastic pieces. Tyson said at that time the plastic pieces may have come from a round, hard plastic rod used to connect a plastic transfer belt. Two incidents in the space of one month are two, too many. Perhaps Tyson Foods need to remind its processing plants to check all of their equipment used on production lines.